Correctly installing a door will help you avoid the associated headache of making adjustments later on. It is hard for people to notice a properly working door; however, when a door doesn’t work correctly, everyone notices. It is therefore important that you follow the correct doors installation procedure from the get go. Since most houses are rarely built to perfection, especially when it comes to door openings, we have compiled a list of useful tips you can use to overcome common structural problems and still hang doors correctly. Before you hang a door, begin by examining the rough opening it is to be installed in. Measure the height and width of the rough door opening to ensure that the door you have can fit perfectly. Next you will need to plumb the sides of the opening. When the rough opening is out of plumb or twisted, you will find that the door opens or closes shut on its own even when correctly installed. You can use a sledge hammer to move the studs on both sides of the opening back to plumb if you notice any problems. When installing shims in the real world, you may find that the standard approach does not work. This calls for an easier and better method. If you find holding the door frame in place while shimming to be awkward, follow this approach. Begin by installing shims on the hinge side and then proceed on to the strike side. 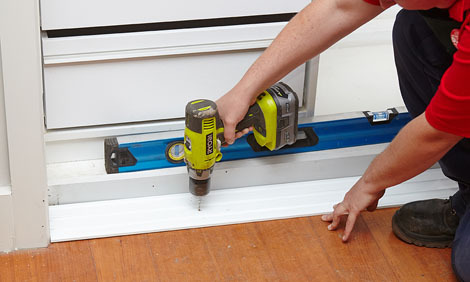 Make sure that there is enough space for the shims by measuring the width of the rough door opening first. If the opening is bigger, you can use pieces of plywood to compensate for this. Be sure to maintain the level. Finished floors may be uneven, and therefore pose major problems during interior doors installations. You need to adjust the jams to ensure that the door is installed level. You can use shims to level the floor; mark the point on the shims where the level is achieved. Proceed by cutting short the jamb on the opposite side by the thickness of the shim used to achieve the level. When installing a door on an unfinished floor, it is important that you leave enough space at the bottom to ensure that it clears the floor when the finishing is installed in future. Otherwise you will have to trim the bottom of the door, something most builders would want to avoid. To get the door properly installed and leave enough space for carpeting or tiles, just rest the jambs on a temporary spacer block. Leave a space of about 3/8 inches below the jambs. Be sure to check whether both sides of the jambs are level. Although builders are aware of standard doors installation procedures, it is vital that they also learn some tips on how to approach less than perfect projects as described above.